Cannabis preparations (vide infra) are derived from Indian hemp plant (Cannabis sativa),* which is a hardy, aromatic annual herb that grows wild under most climatic conditions. Cannabis preparations (vide infra) are derived from Indian hemp plant (Cannabis sativa),* which is a hardy, aromatic annual herb that grows wild under most climatic conditions (Fig 34.10). The plant grows to a height of 5 to 15 feet, and is characterised by an odd number of leaflets on each leaf (varying from 5 to 9), all having serrated or saw-tooth edges, and small, green flowers. The male and female flowers are borne on sepa-rate plants. After pollination, the male plants die back. The main active principle is d9 (delta-9) tetrahydrocannabinol (THC) which is a cannabinoid found in both the male and female plants. The concentration of THC is highest in the bracts, flowers, and leaves, while it is practically non-existent in the stem, root, and seeds. The THC content of the plant varies greatly, and is probably controlled more by the type of seed than by the soil or climatic conditions. Depending on the THC content, Cannabis sativa plants are sub-divided into fibre-type (less than 0.5% THC), or drug-type (more than 1% THC). Seedless (unpollinated female) plant, referred to as “sinsemilla” can contain up to 5% THC. THC is a lipid-soluble, water-insoluble compound which can be synthesised in the laboratory. The synthetic form, however, is very expensive to produce, and so frequently, other illicit drugs such as phencyclidine, mescaline, or LSD are sold in the guise of THC. A product called “super weed” or “super grass” is dusted with phencyclidine. Apart from THC, Cannabis sativa contains a number of other cannabinoids, including cannabidiol, cannabinol, cannabidolic acid, cannabicyclol and cannabigerol. · Marijuana: The term “marijuana” refers to any part of the plant or its extract that is used to induce psychotomimetic or therapeutic effects. Synonyms include Mary Jane, MJ, maconha, pot, weed, grass, puff, and dagga. 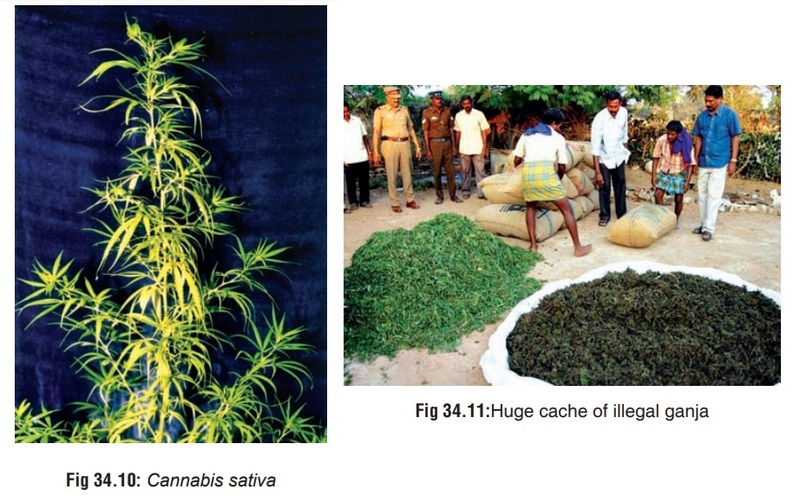 · Ganja: Although some texts refer to ganja as being synonymous with marijuana, while others consider it to be a resinous mass composed of leaves and bracts, in India (where the term actually originated), it is used to refer to crushed leaves and inflorescences of female plants (Fig34.11). It is usually smoked in a pipe (“chillum”) or in theform of cigarettes (“reefer” or “joint” or “number”). Ganja is said to contain 1 to 2% THC. · Bhang: Bhang consists of dried mature leaves and flower stems that are ground with water and mixed with milk or fruit juice (Fig 34.12). It is consumed by Hindus in India during festivals such as Holi and Shiv Ratri. · Hashish (Charas) (Fig 34.13): This preparation is made out of dried resin collected from flower tops, and contains varying concentrations of THC up to 10%. It is popular in the Middle East and North Africa. Hashish oil or “liquid hashish” is an alcohol or petrol extract which occurs as a dark green viscous liquid with the consistency of tar. It is the most potent of all cannabis preparations and contains 20 to 30% (or more) THC. · Sinsemilla: It is the most popular form of cannabis in the USA, and refers to seedless (unpollinated female) plant which averages 5% of THC. · Marijuana “Blunts”: This is nothing but cheap cigars sliced open, packed with cannabis, and resealed. The harsh stench of the cigar masks the characteristic sweet smell of cannabis. Blunts are very popular among the youth in some parts of the USA. · The durable fibres of the woody trunk of cannabis, referred to collectively as Indian hemp, has been used for centuries to produce rope and twine, as well as fine or rough cloth. The cannabis plant is possibly the most efficient source of paper pulp, producing up to 5 times as much cellulose per acre per year, as trees. · Cannabis seeds are used as food by man, poultry, and other birds, as well as furnishing hemp-seed oil for paint and soap. · THC in the form of a synthetic oral cannabinoid (“dron-abinol”) has been shown to be effective in controlling the nausea and diarrhoea associated with AIDS, as well as the nausea and vomiting caused by chemotherapy for cancer or AIDS. It also increases appetite and produces weight gain in both AIDS and cancer patients. It is available from Roxane under the trade name Marinol®, as round, amber, soft gelatin capsules filled with sesame oil in which either 2.5, 5, or 10 mg of THC is dissolved. Another synthetic cannabinoid, nabilone, is available from Lilly under the trade name Cesamet® in the form of 1 mg capsules. · Since smoked cannabis lowers intraocular pressure, it has been suggested that this effect though short-lived (3 to 4 hours), can be utilised for treating glaucoma. · Some studies suggest a possible role for cannabis in the treatment of multiple sclerosis, epilepsy, and dystonic states, though convincing scientific evidence is lacking. · THC possesses analgesic properties and has been tried in the treatment of pain due to cancer. Recently a receptor site has been identified in rat brain that binds reversibly and selectively with cannabinoids. Receptor binding was also found in the peripheral B lymphocyte-rich areas such as the marginal zone of the spleen, nodular corona of Peyer’s patches, and cortex of lymph nodes. A cannabinoid antagonist was also discovered that antagonises cannabinoid- induced inhibition of adenylcyclase and smooth muscle contraction. All this suggests the presence of a cannabinoid neurochemical pathway. It appears that cannabinoids exert many of their actions by influencing several neurotransmitter systems and their modulators. These include GABA, dopa- mine, acetylcholine, histamine, serotonin, noradrenaline, and prostaglandins. Cannabinoid receptor location and density in animal models has correlated well with clinical effects in humans. The highest density of receptors occurs in the basal ganglia and molecular layer of cerebellum, which correlates with its interference in motor co-ordination. Intermediate levels of binding were found in the hippocampus, dentate gyrus, and layers I and IVof cortex, consistent with effects on short-term memory andcognition. Low receptor density is noted in the brainstem areascontrolling cardiovascular and respiratory functions, whichcorrelates with the cannabinoids’ known lack of lethality. After binding to receptors, cannabinoids also produce effects through second-messenger systems including inhibition of adenylcyclase and calcium channels, and also probably by enhancing potassium channels activity. Smoking cannabis generally produces immediate effects, while ingestion results in slow and unpredictable effects due to the instability induced by the acidic environment of the stomach. The most important factor in determining the bioavailability of THC happens to be the smoking dynamics (manner in which the cannabis is smoked). It takes about 15 seconds for the lungs to absorb the THC and transport it to the brain. Peak effects are seen in 10 to 30 minutes and may last for 1 to 4 hours. The mean terminal half-life of THC in plasma of frequent cannabis smokers is 4.3 days (range: 2.6–12.6 days). Tetrahydrocannabinol (THC) is highly protein-bound (97 to 99%), has a Vd of 10 L/kg, and is enterohepatically recirculated. THC is metabolised primarily to 11-hydroxy-delta-9-THC, which is pharmacologically active, but it is further metabolised to 11-nor-delta-9-THC carboxylic acid, which is not active. a. Euphoria with increased garrulity and hilarity, especially when smoked in a social group setting. b. Temporal and spatial disorientation with intensification of sensation (colours become brighter, sounds become more distinct, music is heard with heightened fidelity) and increased clarity of perception. c. At high doses, the user experiences ataxia, dizziness, hallucinations, sedation, and sometimes dysphoria characterised by unpleasant sensations, fear, and panic. d. Sometimes an acute toxic psychosis is precipitated with suicidal ideation, anxiety, and paranoia. Occasionally, schizophrenic symptoms occur. Flashback phenomena have been reported. e. Tachycardia, palpitations, hypertension (high doses). Large doses can also cause postural hypotension. f. Stimulation of appetite (especially for sweets). g. Reduced bowel motility and urinary retention have occasionally been observed. h. Bloodshot eyes due to conjunctival congestion. i. Pupils are usually not affected. Occasionally, mydriasis and nystagmus may occur. j. Coma has been reported in children. · Amotivational Syndrome: Chronic indulgence is said to induce an amotivational syndrome characterised by apathy, poor concentration, social withdrawal, and lack of motivation to study or work. However, the actual existence of such a syndrome is being questioned by some investigators today who state that previous studies had not attempted to adequately distinguish between the effects of cannabis and pre-existing psychological status. · In other words, it is difficult to determine which came first, the drug or the amotivation. Heavy cannabis users demonstrate an increased tendency to develop manic, schizophreniform, and confusional psychoses over a period of time. The development of acute psychosis after chronic use is controversial because of questions about the contribu- tion of premorbid personalities and multiple-drug use. –– Chronic lung disease and carcinogenesis: Long-term smoking of cannabis has been associatedwith chronic sore throat, rhinitis, bronchitis, and deterioration of pulmonary function suggesting airway narrowing. Experiments have revealed that cannabis smoking can cause a five-fold increase in blood CoHb level and three-fold increase in the amount of tar inhaled when compared with tobacco. –– Cancers of mouth and larynx. –– Aspergillosis: Studies have shown that cannabis is often contaminated with Aspergillus spores which can cause aspergillosis in immunocompromised individuals. –– Non-specific ST wave changes have been reported. Prolonged intake of high doses of THC may result in bradycardia and congestive heart failure. –– Several investigators have reported residual poor cognitive performance in heavy cannabis users, which may be due to alterations in brain function, residue of the drug present in the brain, or withdrawal effect. ––Digital clubbing has been reported in chronic hashish users. ––Gynaecomastia has been observed in males. Chronic use may also decrease sperm count and fertility. –– Abrupt discontinuation of chronic cannabis use can cause a mild abstinence syndrome consisting of agitation, aggressiveness, tremulousness, insomnia, sweating, and recurrent migraine headaches. ■■ There are no authentically documented cases of lethality from cannabis intoxication alone. The few cases of fatality that have been reported have not adequately ruled out the possibility of multiple-drug intoxication. ■■ In spite of such lack of documented fatalities, some authors have suggested that the fatal dose for IV cannabis is about 1 to 2 grams, while it is 700 grams for ingestion (of bhang). ■■ According to some investigators, the estimated lethal dose of cannabis in humans is 30 mg/kg of absorbed cannabis. o Characteristic ‘burnt rope’ odour in the breath of a recent smoker. 2. Identification of suspected specimen: Suspend leaf or stem fragments in several drops of chloral hydrate (10%) on a microscope slide and examine under low power for characteristic “cystolith hairs”. These hairs look like bear claws or elephant tusks. At the base of these claws is a wart-like cluster composed of calcium carbonate deposit. Add a drop of 20% HCl and note the gentle effervescent release of carbon dioxide gas in tiny bubbles. 3. Urine levels of cannabinoids: THC is hydrophobic and accumulates in adipose tissue. Screening tests may be positive for up to 70 or more days, depending on the cut-off levels used and the individual’s lipid stores of THC. False positive results may occur with therapeutic use of ibuprofen, fenoprofen, and naproxen. False nega-tives may result from dilution, diuretic use, common salt, or other contaminants (Visine®*, soap, bleach, vinegar, etc.). Concomitant testing of urine specific gravity, pH, temperature, and creatinine could help in eliminating these confounders. Screening tests usually employ EMIT or RIA, while confirmation is done by using GC-MS. A semiquantitative EMIT homogenous enzyme immuno-assay is available for measurement of cannabinoids in urine. Hair analysis can detect drug usage up to 90 days after cessation, and cut-off values are lower for hair than urine. But it is more expensive, and invariably no more useful than urine for cannabis detection. · Decontamination measures in cases of ingestion. · Acute psychotic reactions respond to benzodiazepines. · 5 to 10 milligrams of diazepam orally is usually suffi-cient. · Patients suffering from postural hypotension should be placed in the Trendelenberg position until the blood pressure stabilises. · Psychosocial therapy consisting of attempts to promote realistic and rewarding alternatives to the drug and associated life styles, along with a commitment to abstinence from self-administered or unprescribed psychotropic drugs. · A combination of interventions is recommended, including urine testing, participation in multi-step programmes, education about drug effects, drug coun-selling, psychotherapy and family therapy. · Drug-focussed group therapy comprising strategies such as social pressure to reinforce abstinence, teaching socialisation and problem solving skills, reducing stress and the sense of isolation common with drug abuse, relapse prevention exercises and varying degrees of confrontation. · Short-term use of anxiolytic agents such as benzodiaz-epines may be necessary in some cases when anxiety symptoms are severe. · Short-term use of antipsychotic medication may be required if there are persistent delusional ideas or frightening flash backs. · Cannabis has been around for thousands of years, initially touted for its “medical” uses, and later condemned for its abuse potential. · The mind-altering properties of cannabis probably did not receive wide attention until about 1000 BC when it became an integral part of Hindu culture in India. After AD 500, cannabis began creeping westward, and references to it began appearing in Persian and Arabic literature. · Cannabis was brought to Europe by Napoleon’s soldiers returning from Egypt in the early part of 19th century. It made its entry into the USA at about 1920 when Mexican labourers smuggled the weed across the border into Texas. Its popularity spread quickly, and by 1937 most of the American states had enacted laws prohibiting the use or possession of marijuana. Today, inspite of all efforts at minimising the abuse of cannabis, the drug is the most commonly used illicit substance in the USA. · The use of cannabis among youth reached its peak in the 1960s when the drug became associated with social protest. The hippie generation (“flower people”) was particularly found of cannabis, to whom it was a “gateway drug” opening the doors to more potent “hard drugs” such as opiates and hallucinogens. · Recent reports of medical uses of cannabis have led to the resurgence of “pot culture” beginning with the 1990s. Consumption of cannabis in various forms has always been pular in India. Sanyasis and temple poojaris use it to induce a trance-like state for the purpose of religious medi-tation. There are several festivals such as Holi and Shiva Ratri when widespread consumption occurs even among the general populace. In some areas there are “Bhang shops” openly selling various recipes of bhang (Fig 34.14). · While long-term cannabis use can cause serious health problems (vide supra), acute intoxication sometimes leads to medicolegal complications. The danger lies in the capacity of cannabis to interfere with motor skills and judgement. Operating a motor vehicle or other machinery under the influ-ence of the drug could lead to potential loss of life or limb. · Occasional acute psychotic reactions precipitated by long- term heavy cannabis use can cause the user to “run amok” in homicidal frenzy. This became well known during in homicidal frenzy. This became well known during suffering from acute toxic psychosis arising out of heavy abuse. Cannabis is also known to induce suicidal ideation brought on by anxiety and paranoia. · While cannabis does not appear to have teratogenic effects on the foetus, some studies have indicated that infants whose mothers had used the drug during pregnancy exhib- ited impaired foetal growth.